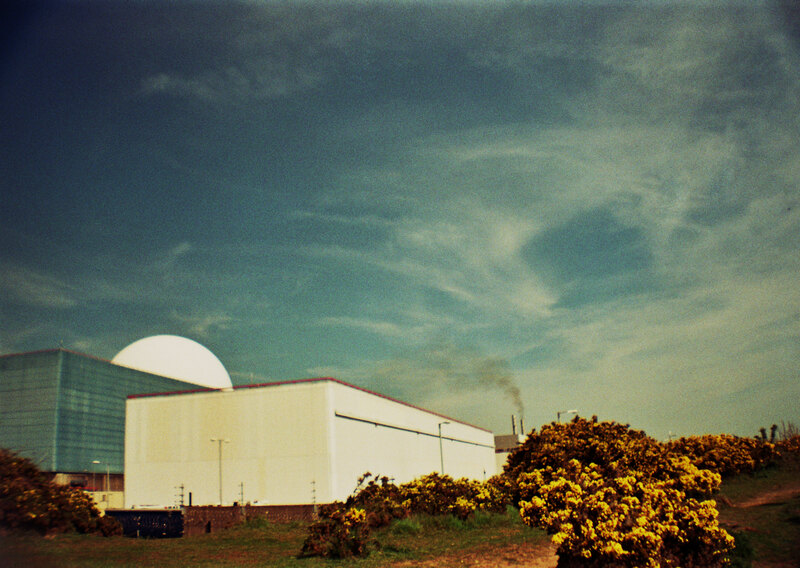 “The contours of the Sizewell power plant, its Magnox block a glowering mausoleum, begin to loom upon an island far out in the pallid waters where one believes the Dogger Bank to be, where once shoals of herring spawned and earlier still, a long, long time ago, the delta of the Rhine flowed out into the sea and where green forests grew from silting sands.” – W.G. Sebald. 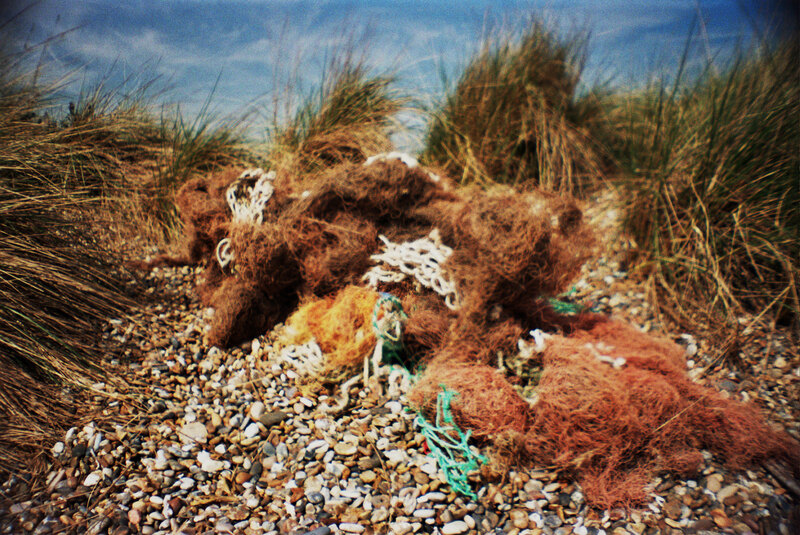 In the past few months I’ve began the mapping of a particular stretch of Suffolk coastline with the aim of producing a trilogy of short films, all detailing the sheer eeriness and interesting ventures provided by merely walking from one end to the other. 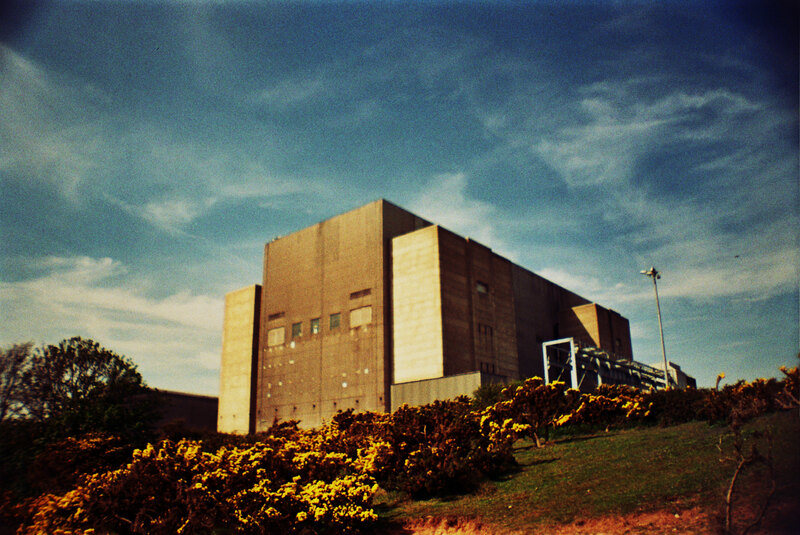 Though this trilogy won’t be completed until well into 2017, the filming and walking has already been undertaken, and this particular dérive details one of the films walks, trudging from the Quatermass vista of Sizewell nuclear power station and its shingly shores, all of the way along past Minsmere RSPB reserve and towards Dunwich Heath and its beach; a territory now arguably defined best by W.G. Sebald in his novel, The Rings Of Saturn (1995). 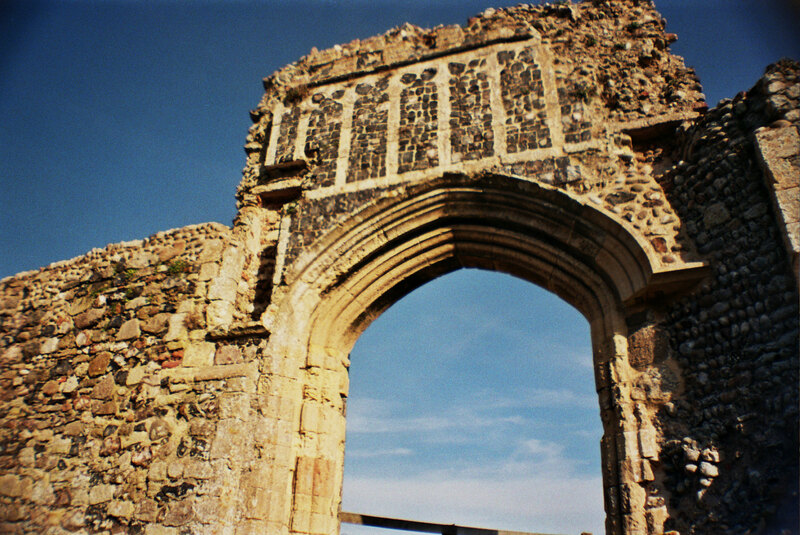 The contrast destined to be conveyed in the film is the extreme irony of having such a dangerous and potentially catastrophic institution adjacent to a coastal area that is undoubtedly the ultimate topographical symbol of transient disaster; the lost shipping town of Dunwich itself, now fallen by and large into the sea over the last few centuries. It was to be a tough but worthwhile walk. 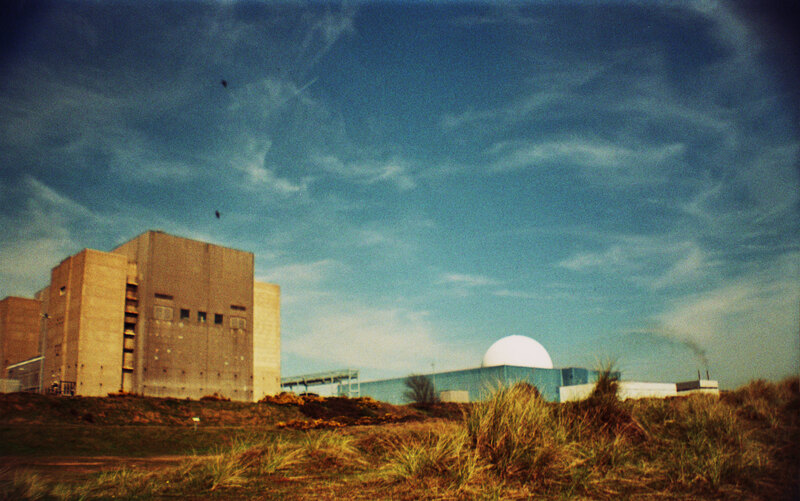 The day started with being dropped off right outside Sizewell A. The sun was ablaze and, in spite of a nuclear place of fission looming large over the landscape, there were numerous groups of people about enjoying the shoreline. There’s even a “Sizewell” cafe, implying the sort of cashing-in on some famous monument or attraction, only with said attraction being a dystopian-looking nuclear power plant rather than something more amiable. I loaded up with various filming gear and trudged off alone into the dunes and marram grass that surrounded the plant. Ironically, the first thing that came to my attention was not the overbearing buildings of the plant itself but two odd structures some way out at sea. The place is clearly a haven for industrial detritus but, by creating such contrasts, it is far more interesting to consider than if such objects were simply placed in an already urban locale. It was not, however, the sheer visual of these places that caught my attention but the sound of screaming emanating unnervingly from their rigging. My ornithologist father later told me that they were the flocks of kittiwakes taking shelter there, though my previous memories of the bird had lacked such an M.R. Jamesian potential. After spending some time rather mesmerised by these possessed rigs, I wandered back from the beach and towards the plant. Though several joggers were about, the place seemed distinctly emptied. This was made even more eerie by how under-surveillance it felt to be walking around its perimeter. Like Winniden Flats of Quatermass II (1957), it was a new protected zone of secrecy with the usual ominous architecture; various security cameras keeping a close and careful eye out as I set up various filming equipment and shot away at the alluring dome of B and the almost art-deco-looking concrete of A. Were they simply making power or was there a pulsating mass of living sludge writhing beneath the whiteness of the dome? Sebald writes of B’s dome that it “can be seen on moonlit nights shining like a shrine far across the land and sea.” (1995). Indeed, the place did produce the feeling of a theological prescience. It seemed, as I climbed the slight incline towards the plant, that the gorse, radioactive with its vibrant yellow and coconut aroma, seemed unnaturally prevalent; as if the plant had sprouted an organic set of defences alongside the typical wire and mesh. The play between this gorse’s yellow and the unusual blue of B’s outer walls was hypnotic, neither seeming real nor unreal, just somewhere in between. Along past the plant, I stopped by a group of concrete cubes to take stock. It was a bad move as my walk had been unknowingly paralleled over the way on the beach by a group of roughly 40 people with a pack of excited dogs. I stood still while various owners attempted to recall several of them from around my legs and filming gear. Only the threat of the owners walking back in the direction of the nuclear cafe eventually drew them away, panting in the endless heat. This point in the landscape seemed a cut-off, as if acting as an official designator for the end of a walk. Even people walking upon the beach but not from the group seemed to stop at this marker and turn back. From henceforth, I was therefore enjoyably alone, pondering the going as small pebbles found their way again and again over the back lip of my boots. The beach was becoming more and more Jamesian as I kept looking back; trying unwisely to find menace in the odd silhouette of a far-away walker. 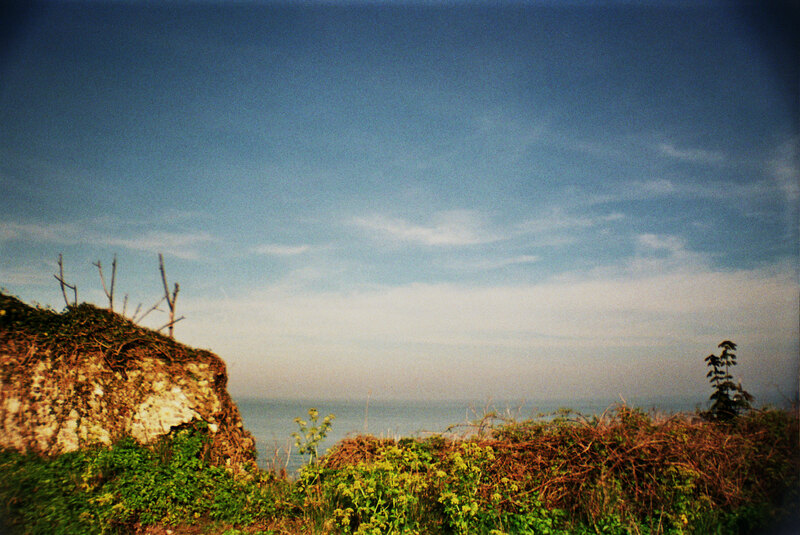 It reminded of one of my favourite lines from James’ “Oh, Whistle, And I’ll Come To You, M’Lad” where its character, Parkins, “quickly rattled and clashed through the shingle and gained the sand, upon which, but for the groynes which had to be got over every few yards, the going was both good and quiet.” (1904). 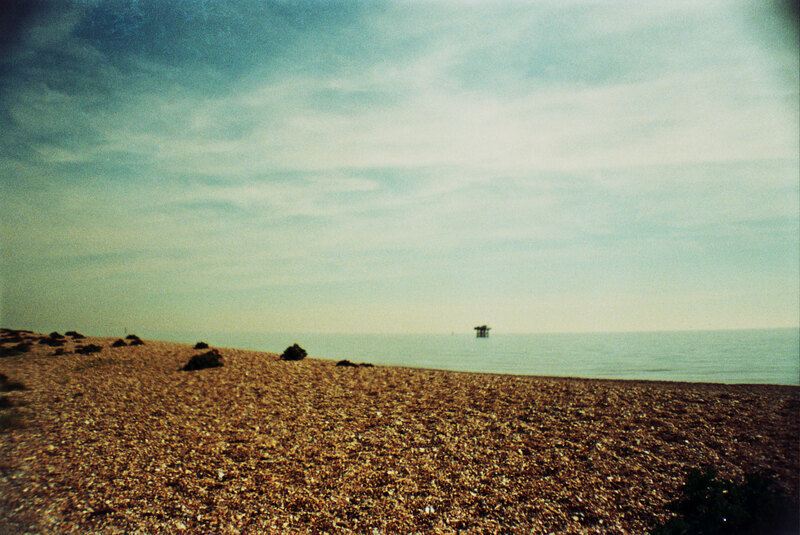 Again such a contrast, where quiet doesn’t necessarily mean noiseless, as his feet “rattled and clashed” upon the shingle, but means something altogether more worrying. My walk was the same and I took great pleasure at feeling at some ineffable mercy of the landscape. Sadly it was only to be the sun burning down upon my own neck that would later haunt me for days afterwards. 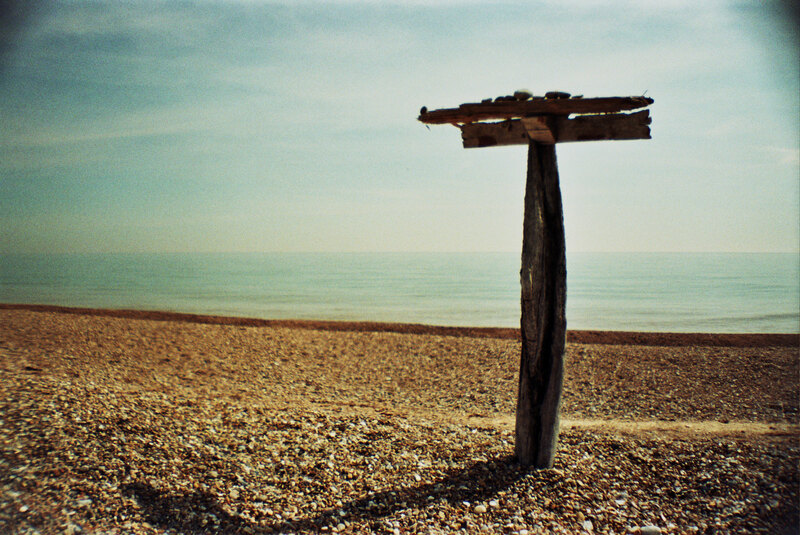 This sense of aloneness was broken almost instantly when I came upon a strange, clearly man-made monument constructed some way down the beach. It wasn’t near enough to the slowly approaching Minsmere or to the cafe back at Sizewell to be of easy reach and yet here it was; standing like a lost totem to some unknown nuclear god. I continued on, stopping and starting to keep removing the increasingly jagged rocks that ventured into my boots and cut into my feet. As I rounded the corner of the coast, the atmosphere again changed; people became more and more prominent until it felt like a high-street, lacking only a proper pavement for the full urban effect. I had hit Minsmere Reserve, the Mecca of birdwatchers and general wildlife watchers alike. I had left my father here on every single day of the three-day trip, such was the draw of the place. No doubt the wildlife there is stunning (on a visit last year, they had even caught a death’s-head hawk moth which was a first for me) but something felt different to the previous segment of the beach. The path all of a sudden felt surveyed in a different way. The grassy beachscapes gave way to wooden fences and literal coach-loads of people carrying equipment of varying sizes along the narrow pathways; some which made my own filming escapades seem like a pleasure jaunt in comparison. I followed the path along from the reserve quickly and away from its multitude of people, up a gravelly track towards the heath. 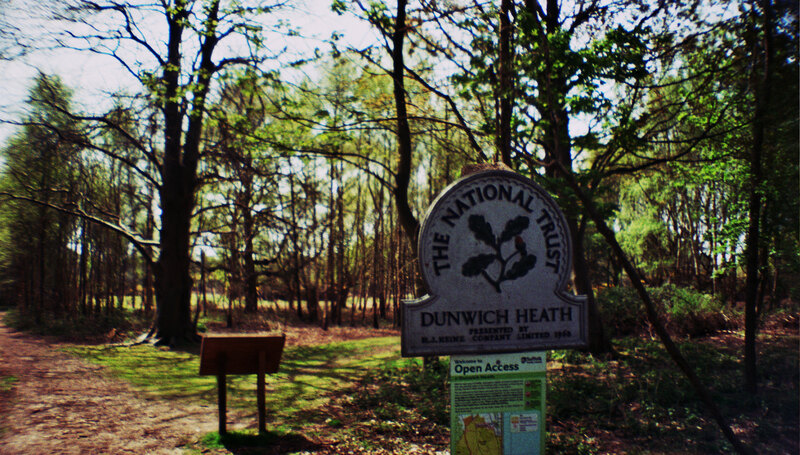 The faded purple of the heath began and I knew I was then officially in the territory of Dunwich. 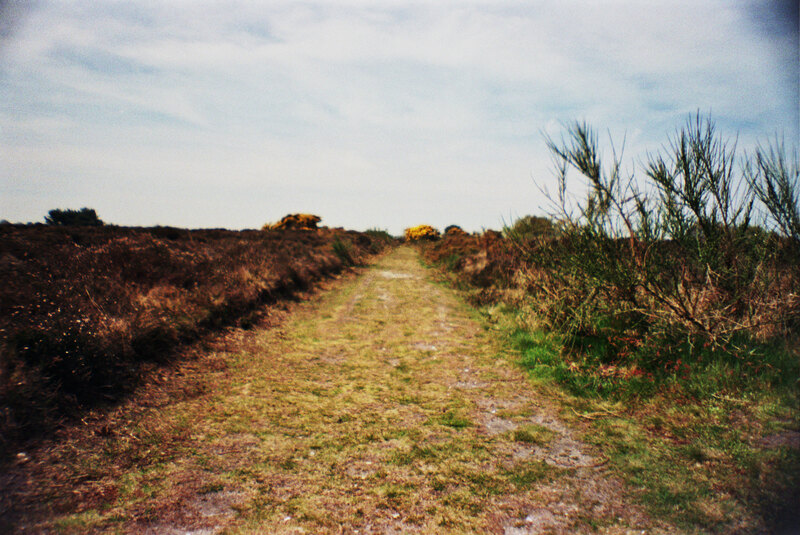 The pathway instantly recalled Sebald’s meander onto this heath, one where he explicitly got lost, as if the paths among the heather were sentient and playing deliberate tricks upon him: “Shading from pale lilac to the deepest purple, it stretched away westward, with a white track curving gently through its midst. Lost in the thoughts that went round in my head incessantly, and numbed by this crazed flowering, I stuck to the sandy path until to my astonishment, not to say horror, I found myself back again at the same tangled thicket from which I had emerged about an hour before, or, as it now seemed to me, in some distant past.” (1995). The heath is officially National Trust owned now though, unlike other places owned and procured by the company, this one was desolate and empty. I sat on the bench overlooking the reserve and looked over to the dome of B; this was the bench whose view initially inspired the desire to make the film that had brought me back. I ate here, accompanied only by the occasional rustling lizard in the vegetation (and even a tiger beetle, an insect I hadn’t seen for years). The walk with the equipment and in such blistering weather had taken its toll, and I sat at the bench for some time recovering from the first two thirds of the walk. Sebald was constantly coming to mind at this point, the heath having much prescience to its chapter in The Rings Of Saturn. He found the same omen in its dusty vistas as I had, where the unnatural destruction of place through man-made catastrophe felt palpable; the coastline acting as a temporal portal to another time and memory. The heath slowly dissolved away into forest and, simultaneously, a noise began to grow. At first, it had the likeness of white noise or distortion, as if an old television set had been left on an unprogrammed channel. As I approached the road, I realised that the noise was coming from a particularly loud caravan site; the smell of chips and the sound of screaming children both wafted through the forest. I began to wonder what frame of mind Sebald must have been in to block this out, so contrary was it to his own pessimistic solitude. He was, after all, contemplating the very destruction of civilised western society when walking these dunes and its heath. Would such a thought have come so poetically if encountering such a surprisingly lively area? 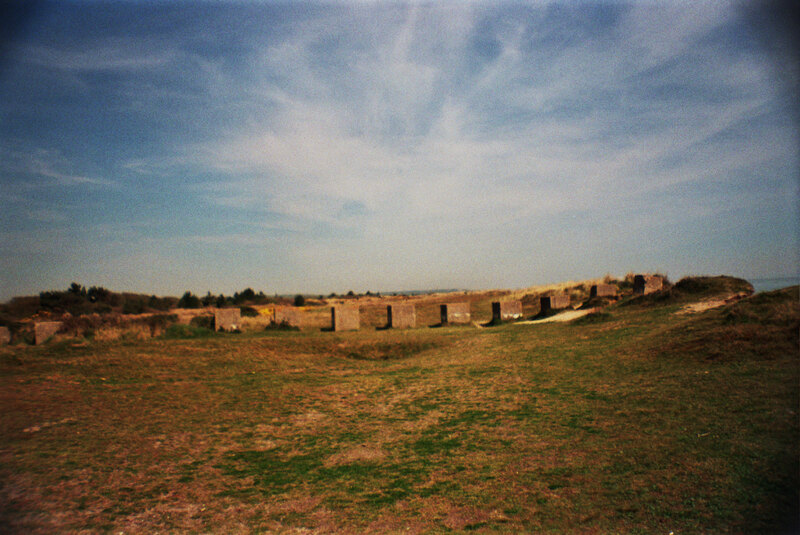 Perhaps the site was yet to be built in 1995. It felt far more moribund than it ought to have but essentially it quickened my pace down the endless road, past houses selling small clumps of vegetables and other home-grown objects. Turning onto the main road, it became clear that it was closed, the traffic being almost A-road-like on my last visit but now sparse and enjoyably absent. I followed it through and along all of the way down to where a large and quite friendly pig is kept in a bit of wooded forest. Here, another road gently meandered off, distinguished by quaint county cottages and a darkening piece of woodland. 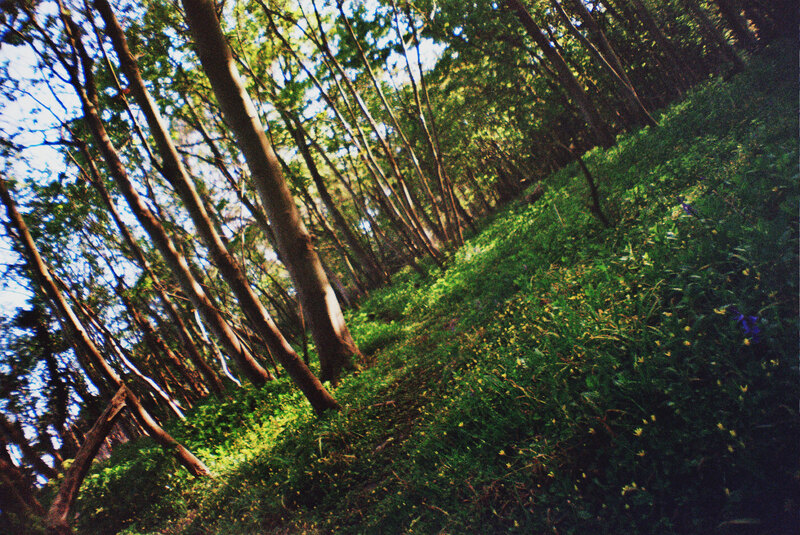 Eventually the path lead to the woodland on the very edge of the Dunwich cliffs. When last visiting, it became clear that this was the forest that partly inspired Jonathan Miller’s adaptation of James’ Whistle And I’ll Come To You for BBC Omnibus in 1968. Though largely filmed up the coast in Norfolk, specifically Waxham, the forest segments could easily be filmed here (and I have a strange feeling that some of them actually were). 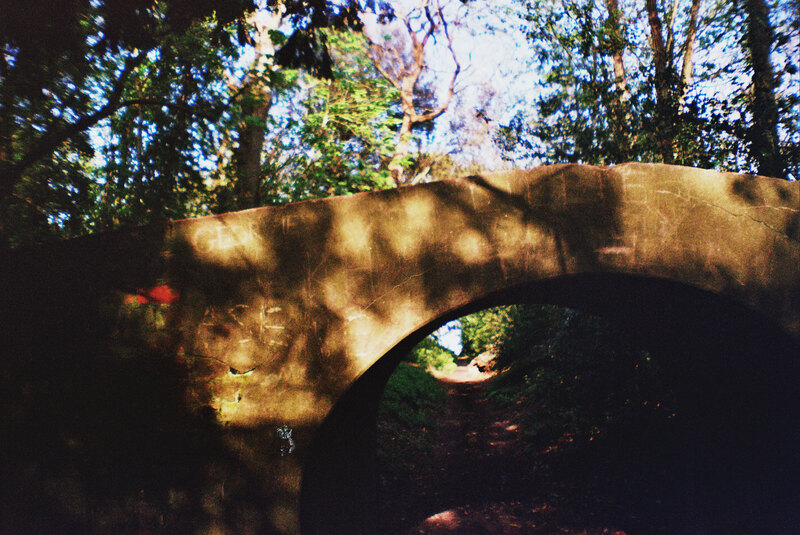 An odd concrete bridge hangs over the wooded path and I walked under and followed the leafy route all of the way to cliff’s edge. 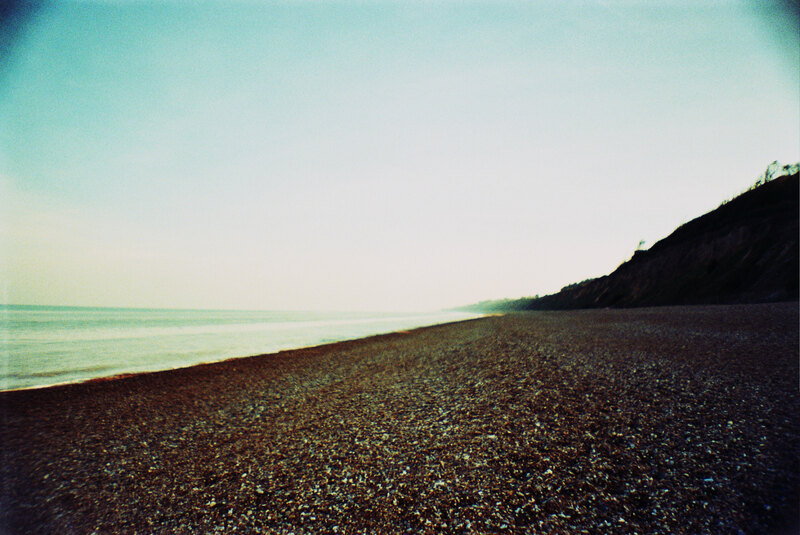 The soundtrack in my head changed to Brian Eno’s Dunwich Beach Autumn 1960 from his Ambient 4 – On Land (1982) album, the cliff ebbing away into the ether even as I stood over it just like his music. Ignoring the paranoid signage of the place, I sat hanging my legs over and watched. I don’t believe in the straightforward notion of rural enclaves healing weary urban minds but, on this one occasion, it was accurate. 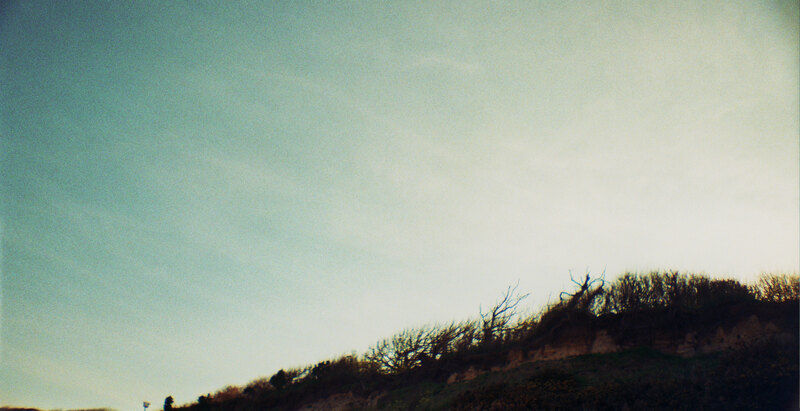 The waves were gentle below and a cooling breeze blew as the stones and bones crumbled away into the air. I doubled back along the path after some time contemplating, and was surprised to find an almost perfect holloway; they seem to sprout in the most wonderful of places. 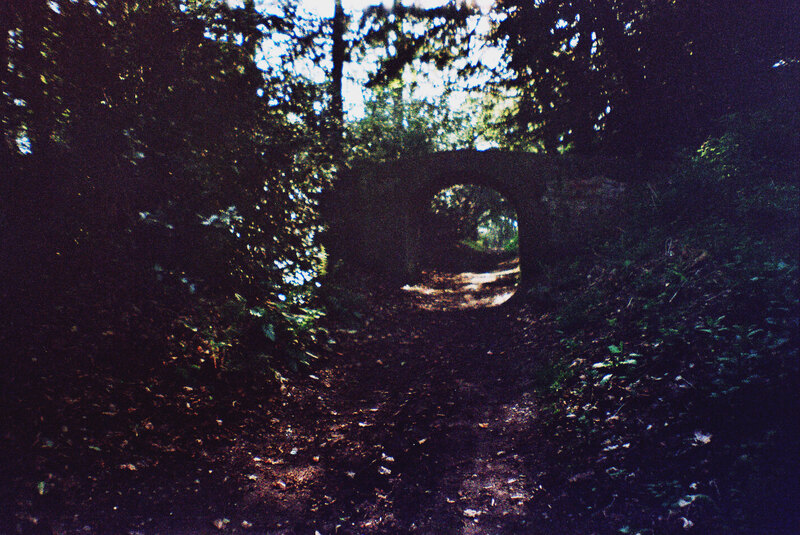 The path was followed, broken up by scuttling rabbits and confident blackbirds, before hitting the final stop on the walk, the Grey Friars Priory. 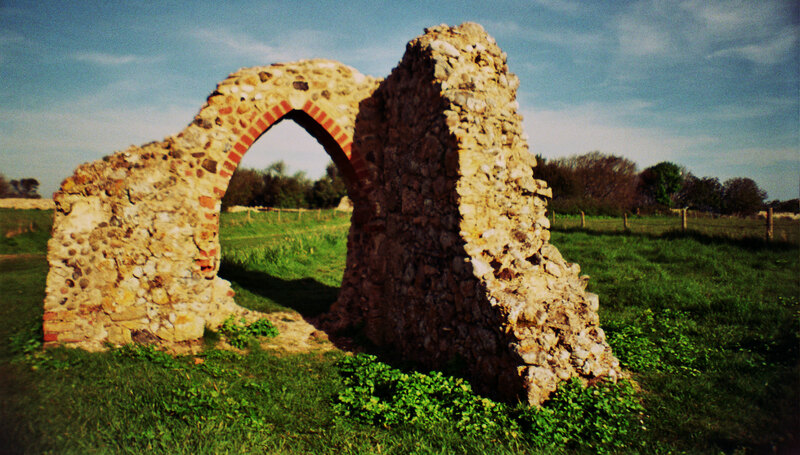 This is one of the last buildings left standing from the original area of Dunwich, appropriately crumbling itself and now an open ruin with a few fields either side. 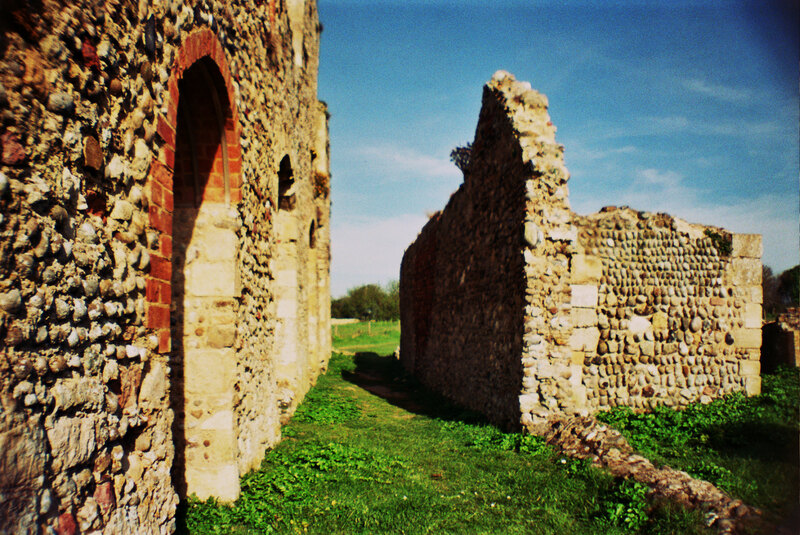 Sebald again came to mind, a ruin acting as an aleph of both past and future calamities: “Dunwich, with its towers and many thousand souls, has dissolved into water, sand and thin air.” (1995). Of even more prescience was the “last grave”; a gravestone standing on the very precipice of the cliff where there was once a full graveyard. A few more dogged winters will drag it down into the sea though hopefully not before a respected antiquarian has had time to find a whistle from its fallen structure: “Ahh, give a dog a bone!” (1968). 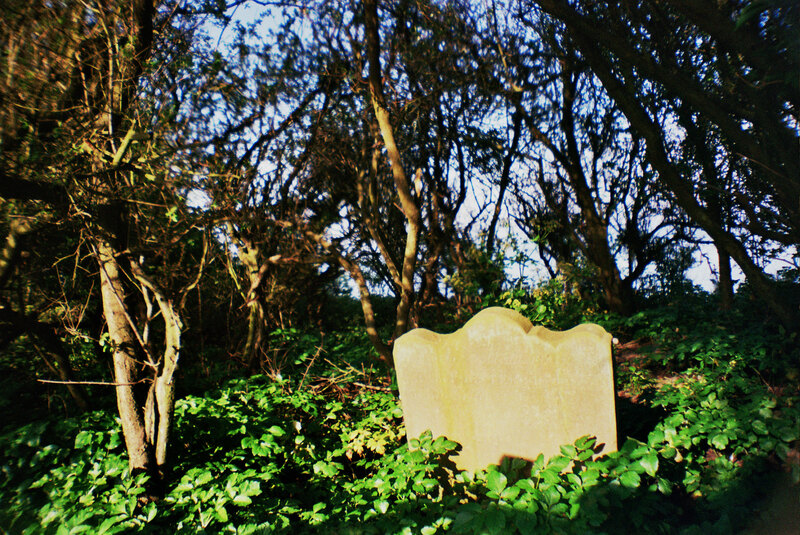 I walked along the path to the relatively busy car-park next to Dunwich beach, wandering back upon myself some way out until the sound of people had died away again. I dropped my bags of filming equipment down onto the shingle and I quickly followed. In the distance and around the coast, I could just make out Sizewell again as its eerie dome jutted out over the peak of the land. I sat quietly and waited for my lift which was not due for another hour (with added “Minsmere distraction time” of course). 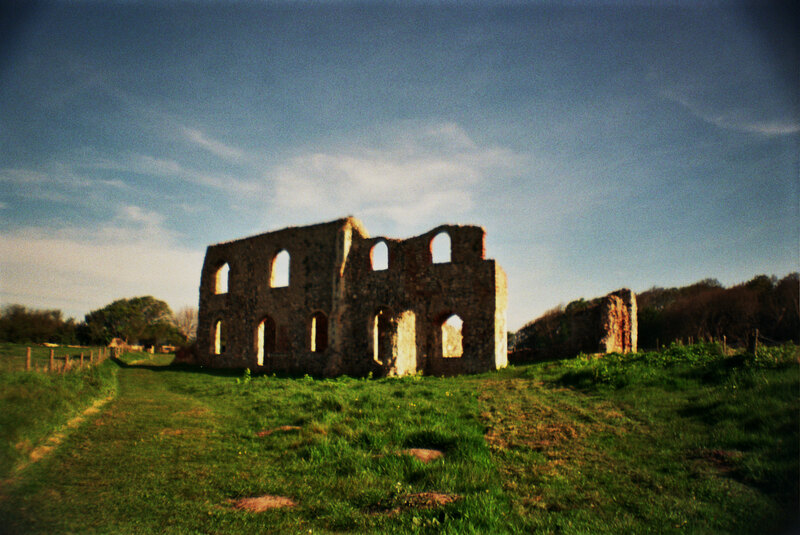 I had brought Sebald’s On The Natural History Of Destruction with me, one of the few of his books I have left to read, about the destruction of German cities during the final years of the war; ghosts of flames and burning buildings came to join the ghosts of Jamesian bed-sheets and Dunwich horrors that already were floating in the ether. I sat waiting and reading as the tide slowly drew the pebbles of the beach back and forth, awaiting the future calamity to repeat yet again: “a last glimpse of the land now being lost forever.” (1995). Hi Adam! This is great. I’m looking forward to seeing your short films. One of my favourite beach walks runs from Borth to Ynyslas on the West coast of Wales. It’s best in the winter at low tide, when it’s vast and empty and ominous. Sometimes i’d watch Whistle and I’ll Come to You, and do the walk at dusk for extra chills! I recommend it if you’re in the area. May I ask, what camera / after effects did you use to get images like those? Glad you liked this. I’ll have to check this place out when I’m next around Aberystwyth. Really enjoyed reading this, and the images too, as it is a coastline I visit every year, first two weeks in August, staying at nearby Southwold. 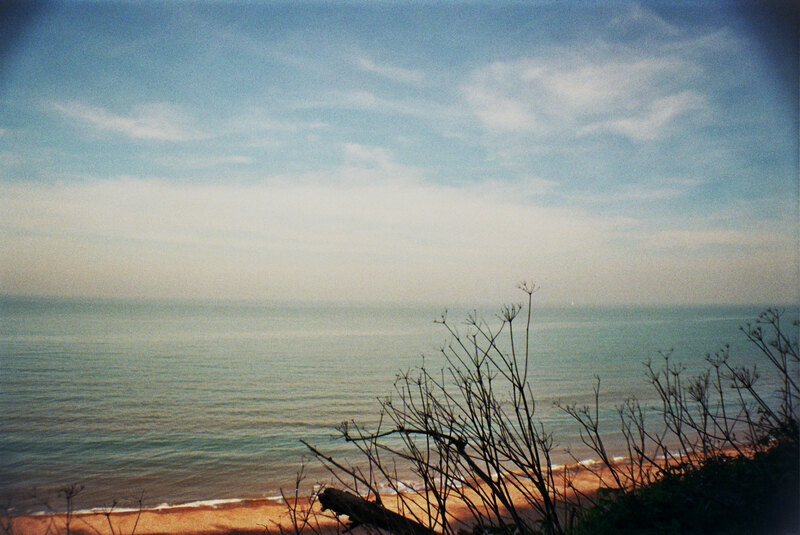 Always do a walk to Dunwich & back and occasionally to Sizewell. Seabald echoes on every visit, especially in the northerly direction, up to Covehithe and beyond, a stretch of beach I have been painting for the past 15 or so years. Attached some images for your interest. I exhibited some last year at Enitharmon Editions in London but have yet to show any in Liverpool. I was sorry to miss your recent event at Calderstones, which my friend Colin Dilnot (who I think you know) reported was an excellent day. If you are ever at Bluecoat let me know as it would be good to have a coffee. Not sure if Colin has told you about our Malcolm Lowry annual gatherings. We have pretty much done his Merseyside origins to death psychogeographically, but Colin is forever uncovering new resonances. Responses: Andy Goldsworthy’s Ice Arch (1982).